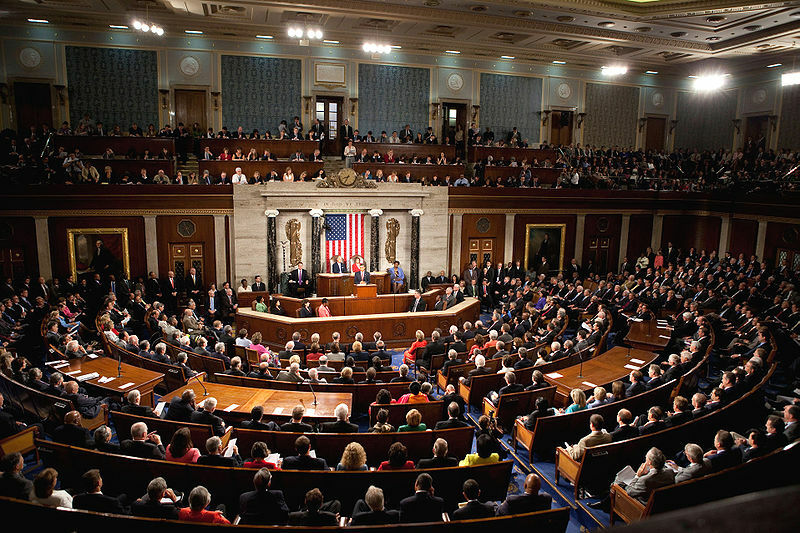 President Barack Obama speaks to a joint session of Congress regarding health care reform. Photo courtesy of Lawrence Jackson. Our nation’s legislative home, is the necessary fixture for discourse concerning the most pressing issues that citizens face. To do this, Democrats, Republicans and Independents must all sit side-by-side and draft legislation. In other words, heart and soul of Congress is imbued with the capacity for bipartisanship and expected to make effective use of it. Bipartisanship in a representative system comes as a result of local government officials aligning local concerns with that of the other localities represented to make up what is best for the whole. The question then becomes how can our representatives and senators serve their own partisan interests while also making bipartisan progress? A Dartmouth study of 304,763 speeches made on the floor of the House of Representatives between 1994-2012 indicate that legislators do not tend to focus bipartisan policy making on issues that garner meaningful support from both parties. “Although the term ‘bipartisan’ has strong positive associations, it lacks a clear definition. Representatives exploit this definitional ambiguity to present their work as bipartisan, knowing that a majority of constituents view the concept positively and associate it with a normatively good aspect of democratic governance,” the study said. Basically, everyone wants to be seen as working both sides of the aisle and not clogging DC’s pipes, and bipartisanship is effective only when representatives craft legislation that matters to and satisfies both sides. The ability to see past the partisan implications of any policy indicates the success of true bipartisanship. However, people whose voices can significantly affect the state of bipartisanship are those who elect representatives. Analysis of House speeches failed to prove that anything other than voters perceptions affirmed bipartisanship rather than reality. “Broad coalitions of representatives and ideologically moderate legislation are both factual indications of bipartisanship. However, voters require neither when evaluating claims of bipartisan action. Constituents are responsive to assertions that legislation is bipartisan even when the legislation is overtly partisan in purpose. Thus, members of Congress can cultivate impressions of moderate policy-making with minimal effort and without defining or justifying what bipartisanship actually means,” reported the Dartmouth study. When government is heavily reliant on posturing in regards to what people and other governments think, what is generally accepted as true is taken as such. A particular sphere where bipartisanship is especially useful is the sphere of foreign policy. The American image towards other countries is benefitted when it is one of unity, success and effectiveness. Henry W. Berger, history professor at Washington University, recognizes bipartisanship as a way of simplifying American diplomacy and coordinating strategy towards common goals. “Bipartisanship as an active, sustained strategy of foreign policy appeared a few years after World War II, during the crises of American power abroad in the two succeeding decades. It was a calculated attempt to minimize or to avoid altogether the schisms of debate over the tactics of foreign policy which could threaten the conduct and conceivably, though perhaps not intentionally, the substance of American diplomacy,” Berger said. Foreign policy is inevitably difficult so it is reasonable to assume lawmakers want to find the easiest possible route to dealing with foreign policy. “Policy-makers and politicians appealed to what former Secretary of State Dean Acheson called the ‘nonpartisan oil of government’ as a means of reducing the difficulties in the way of maintaining continuity and predictability of action by the United States overseas,” reported Berger. Achieving this perception of bipartisanship is a result of the persuasive efforts of congresspeople. Rhetorical manipulation on their behalf can shape constituents’ perceptions. Jonathan Morris and Marie Witting, professors at Purdue University, conducted research on the partisan attitudes in Congress. They found that the psychology of voters perception of the government made it easy for them to give them exactly what they want. “If viewers witness a Congress that is in direct conflict with the image perpetuated in the media, we expect to see a different reaction. As Hibbing and Theiss-Morse (1995) concluded, the American public wants a Congress that is basically the opposite of what they perceive it to be at the present-bipartisan rather than partisan, swift and efficient rather than slow and deliberative. Witnessing Representatives who voice rhetoric of bipartisan cooperation, institutional efficiency, and a desire to work together can undo some of the damage that past media coverage of Congress has done,” Morris and Witting’s study said. The secret to bipartisanship hasn’t been one of bipartisan cooperation necessarily, as much as it has just been the propagation of rhetoric aimed at satisfying voters. Confidence in the democratic system is sustained by the sort of cooperation that bipartisanship implies and, so far, it has been successful at achieving that confidence.